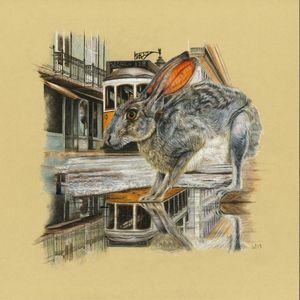 Rich coloured pencil drawing depicting a hare in an urban setting, appearing startled at the daunting task of crossing a road. Layers of coloured pencil are used to create depth to the fur and to add manic character to this hare. Amber tones were used both in the hare and tram to bring unity and further warmth to the piece, giving a nostalgic feel. Blues, pinks and purples can be found where reflected light has brought out wonderful tones in the fur. 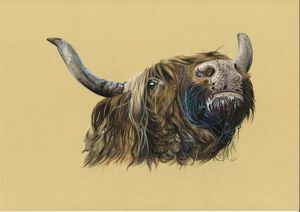 Scottish pet portrait and wildlife artist specialising in rich coloured pencil drawings using layering and blending techniques to create depth, warmth, texture and character in my pieces. 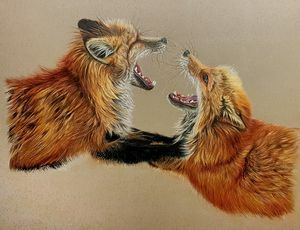 A love of all things fur & feathers drives my passion for art.